Unfold the pastry sheet on a lightly floured surface. Roll the pastry into a 14 x 10-inch rectangle. Spread the pastry evenly with the jam. Cut the pastry in half lengthwise. Sprinkle one rectangle with the chocolate. Place the remaining rectangle over the chocolate-topped rectangle, jam-side down. Roll the pastry gently with a rolling pin to seal. Cut the pastry crosswise into 28 (1/2-inch) strips. Twist each strip and place them 2 inches apart on greased baking sheets, pressing down the ends. Brush the twists with the egg mixture. 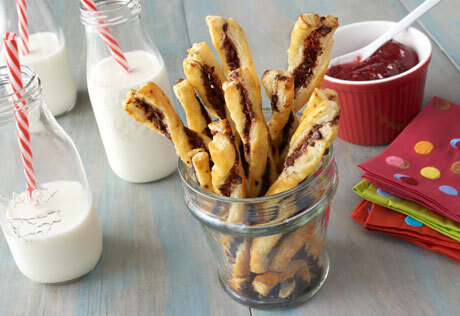 Bake the pastry twists for 10 minutes or until they're golden brown. Serve the twists warm or at room temperature.